Organic leek and potato sausages made with Riverford veg, filling brown rice and soya beans. 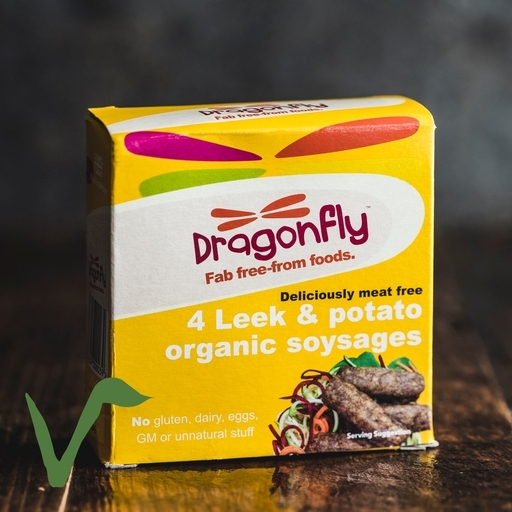 These veggie sausages are nice and fat, with a good firm texture and gentle peppery flavour. Ideal for quick meals. There’s no need even to warm them up in you’re in a hurry. Serves 2. Can be eaten hot or cold. Before cooking, remove all packaging. Either grill for 5 mins each side, fry for 3 mins each side, oven bake for 15 mins at 190°C/Gas 5 or microwave for 2 mins on full. Keep in the fridge or freeze on day of delivery. Thaw before cooking, once opened consume within 24 hours. Made by our friends at Dragonfly, a family business just down the road from our farm in Devon. Dried potato flakes (40%), cooked brown rice (32%), leeks (10%), soya bean fibre (11%), black pepper, sea salt*, garlic, onion, sunflower oil.